The Mongolia-UK Round Table meeting was held on April 26, 2017 in Ulaanbaatar. 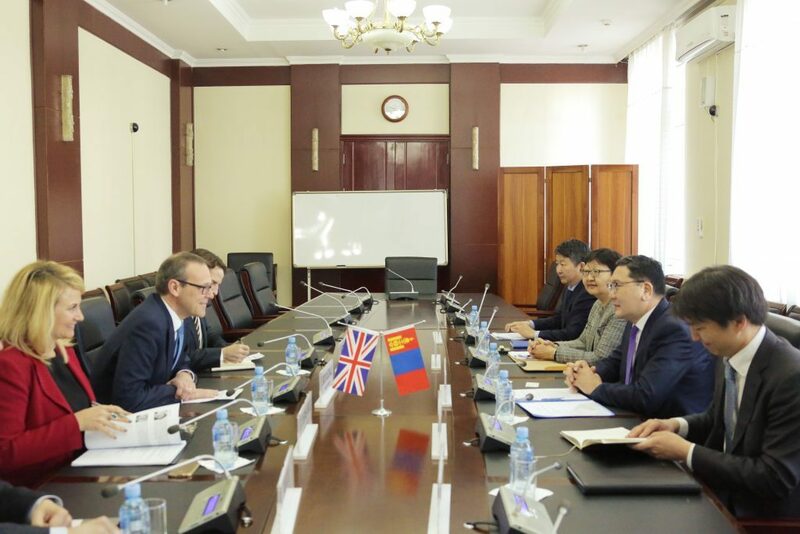 The Mongolian delegation was headed by D.Davaasuren, State Secretary of the Ministry of Foreign Affairs of Mongolia and the British delegation was led by Sir Simon McDonald, Permanent Under Secretary and Head of the Diplomatic Service at the Foreign and Commonwealth Office. The two sides exchanged views on the current situation and the actions to take towards enhancing cooperation in the fields of politics, economy, investment, defense, education, environment, multilateral cooperation as well as regional issues of mutual interest during the Round Table meeting, an important mechanism of consultation between the two countries. Furthermore, Permanent Under Secretary Sir McDonald gave a lecture on diplomacy titled “Masterclass in Diplomacy” to junior diplomats, scholars and students in the field of International relations.